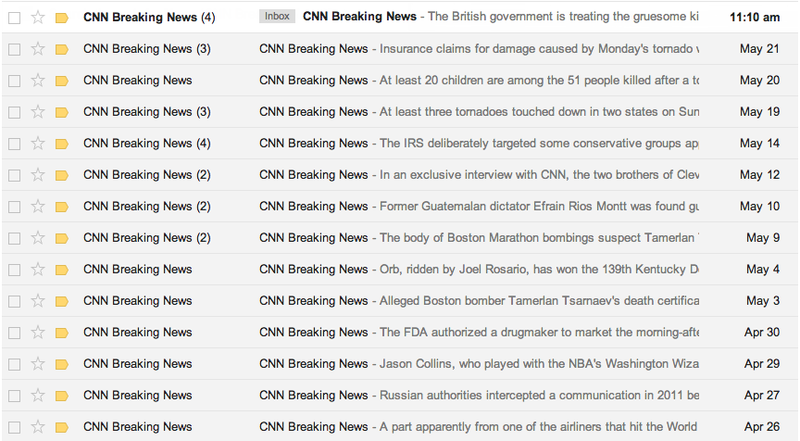 I’ve been an email subscriber to CNN’s Breaking News alerts for over a decade. In the beginning, it was sporadic and you might only get an email every couple weeks when some major disaster happened in the world. About five years ago it became once every few days, but still limited to major news events. Lately, it has become several emails per day. At this point, I can’t tell if CNN is really sharing large rare events or if they determined they could use this as a traffic source to their site to increase profits. Worse yet, instead of being limited to worldwide major events, the emails contain the results of reality shows, final scores in basketball games, or minor news about the US economy. It’s become such a frequent email that it no longer feels like a rare alert system for tomorrow’s worldwide front page headlines, instead it feels like I’m following the most dramatic personal blog written by someone dealing with one daily tragedy after another. Yesterday, I noticed blogs lighting up as they passed along the story of a mother supposedly twittering while her son drowned and the massive backlash that followed including instant accusations of parental neglect. The story sounded too good to be true, the kind of stuff people write in their heads and hold in draft mode until the first opportunity presents itself to publish it, so I didn’t read the specifics until this morning at ABC News. As an avid twitter user myself and someone used to sharing information about my life with friends online for 10+ years, I was astounded at the amount of negative attention the mother, Shellie Ross was (and still is) receiving from the story. I’m someone in a similar position who posted to twitter (while in my hospital bed) just a few hours after my initial diagnosis of having a large brain tumor, and I have to say it was specifically so I could let my immediate friends and family that follow me on twitter know exactly what was going on as soon as possible. Posting to twitter meant I didn’t have to do a dreaded phone call to dozens of people immediately after hearing my diagnosis, and for me it was both a time saving way to get the word out as well as the easiest way to communicate while I was exhausted and in and out of consciousness in the hospital. The obvious sticking point in many stories about this drowning incident seems to be about new media and old. No one is surprised at frantic cell phone calls in a hospital waiting room, but apparently button mashing on a cellphone to alert friends via text to twitter is a surprise, simply because it is new. What happened was a tragedy plain and simple. The family was doing things in the backyard, the pool gate didn’t get closed, and an accident occurred. Some time after (reports vary but it looks like about half an hour after paramedics arrived) she updated her friends and family and asked them to pray for her son. This could have been on the trip to the hospital, as she was leaving home, or when she first arrived. Five hours later he was pronounced dead, and she updated her friends and family with the terrible news. I myself posted to twitter five times from the hospital after my initial tweet, bringing people up to speed as I learned more. Half a day after I settled in at home I wrote a blog post further explaining it. I did this again to fill friends in and so I didn’t have to relay the story 1,000 times later. I was commended a lot privately and publicly for being open and honest and sharing my story but to be frank I really don’t know of any other way to be, this is just naturally the easiest way to communicate with friends and (some) family. Since my parents weren’t tuned into twitter, I did have to call them on that first day, and each day there after. In the end when I got home, I had to call about a dozen friends and family members that also aren’t aware of my twitter account (or even what twitter is), and I have to say those were some of the most difficult calls to make, to drop bad news on happy friends and family. It was hours of work too, to explain and answer questions over the phone. Twitter is a great tool for personal broadcast to a vast set of friends and family and it’s quickly turning into a new default communication medium for the online world. It can certainly be distracting in the face of day-to-day cubicle work, but in this specific case it appears certainly to me that it had nothing to do with the death and was actually helpful at alerting friends to the accident and later informing them of the tragedy, and mirrors my own use of the service in a vaguely similar situation. Philip Greenspun, owner of a Cirrus SR20 himself has a great post speculating on what happened in today’s crash in Manhattan. What many assume was terrorism or suicide might have just been a couple minor mistakes resulting in the bad crash. I’m really happy about this and think it’s a good thing. Like I said last month, YouTube offers a fundamental shift in how video is shared online and provided a free hosting outlet for millions of people. YouTube proved that broadband and video can actually work and it doesn’t have to cost every producer an arm and a leg. The rest is all details, though I understand profits and lawsuits over IP are pretty big details. I would put this purchase up there with the Blogger deal. Google saw this app that provided a huge shift in how people interact online and snapped it up. Same with Writely, same with Picasa (though I’m sure they wanted Flickr back when it was independent). Google used to just be a search company but now they’re looking more like a very smart media company buying up all the best-of-breed services. I do wonder how on earth they’ll fold YouTube into Google. If they just merged the YT content into Google Video, all the personality and social aspects of YouTube would be lost, but if it stays independent, then they have two brands offering much of the same product competing for engineering and legal resources. Congrats to the YouTube team and kudos to Google for snatching it up and keeping bandwidth costs at zero for young filmmakers. I’m right there with Mike on the planets thing. I love that there are people fighting tooth and nail over this stuff. Five undergraduate programs are being dropped: civil and environmental engineering, mechanical engineering, electrical engineering and computer science, computer engineering and exercise and sports science. Tulane University got rid of their Civil Engineering program in the wake of Katrina. Doesn’t that seem odd? At the time when New Orleans needs to be rebuilt, the biggest university there dissolves the training for people that build things. I’m sure a lot of graduates helped build and rebuild the levees all these years. This slideshow (via mefi) is one of the most amazing accounts I’ve seen of the hurricane, before, during, and after. It contains photos from familiar landmarks and areas of the city and shows pretty clearly why people that stayed behind didn’t think it was going to be that bad, and as it progressed, just how bad it would get. When the story gets to the lines awaiting buses you can feel the helplessness of the people left behind. Looking at these photos knowing what we know now, I can’t help but remember looking through a 9/11/2001 set of photographer’s photos that told a similar story of a major event: calm followed by surprise and confusion and later untold devistation. Nothing I’ve seen on TV or online comes close to the complete story this gallery of images gives. It’s worth sitting through every caption and following along. Chilling stuff.